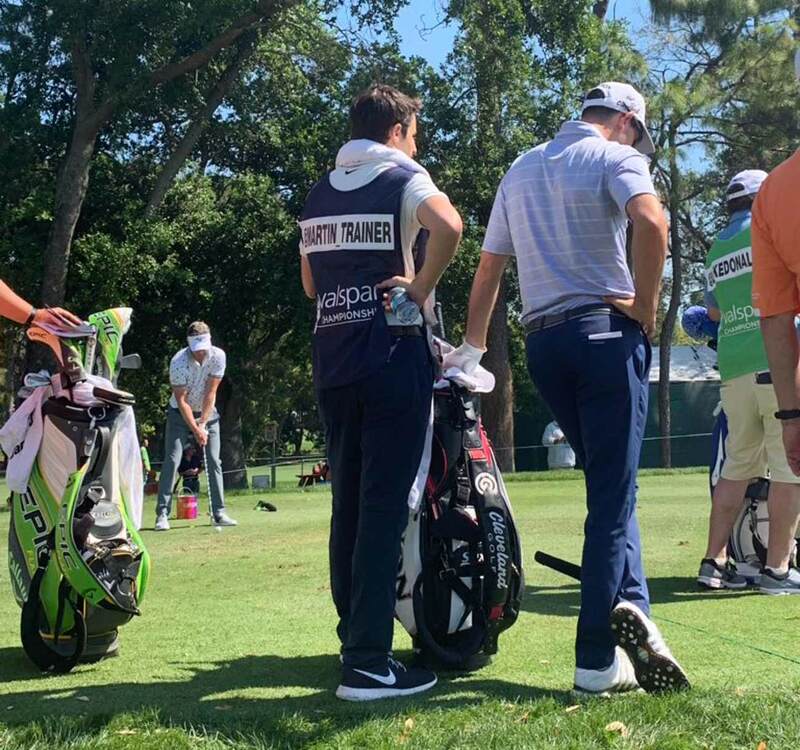 This is the latest installment in Dylan Dethier’s week-long series, in which he’s chronicling what it’s like to be a PGA Tour caddie. You can also read dispatches from Monday, Tuesday and Wednesday. 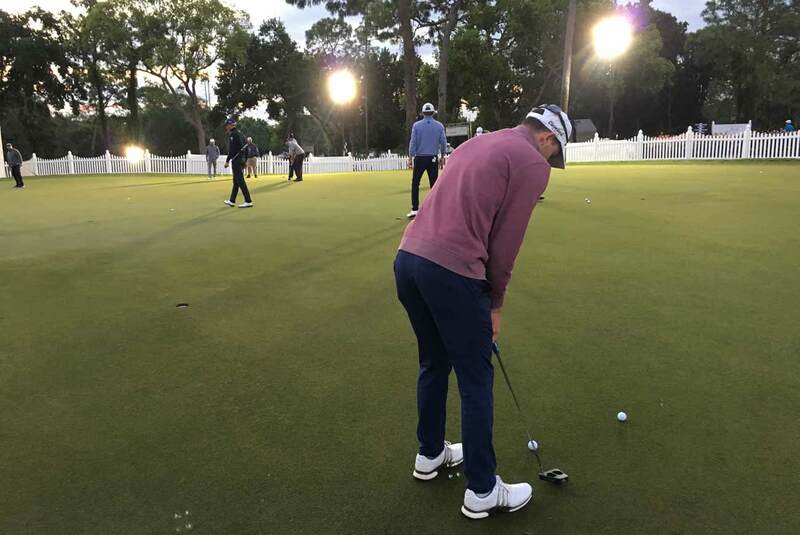 PALM HARBOR, Fla. — On the PGA Tour, mornings begin in the dark. Martin Trainer’s 8:24 a.m. Thursday time meant waking up at 5:20, heading to the course, hitting the gym (the player, not the caddie) eating breakfast, putting under the floodlights, chipping, hitting the range and scampering up to the first tee at 8:21, just in time to join Kevin Kisner, Luke Donald and their caddies, with a rookie caddie (that’s me) in tow. The entire routine was new to me. Snagging the correct type of balls on the range (Srixons, the black ones, not the red ones). Throwing on the bib by the 1st tee and tying it up on the sides. Figuring out who grabs the pin from the hole (the caddie of the guy furthest away, ideally) and who puts it back in (whomever’s player finishes out last). Also looming over me was the constant nerve-wracking threat of having to rake a bunker. Martin Trainer putting under the floodlights just after 7 a.m. But things got off to a dreamy start for team Trainer/Dethier (yes, I’ve lapsed fully into caddie parlance — it wasn’t “he” but “we” playing Thursday’s first round at the Valspar). Martin launched his tee shot down the center, well past Luke Donald and Kevin Kisner, and smoked a two-iron pin high on the right side of the green. Boom! Easy two-putt birdie. One under. I successfully pulled and replaced the pin, and Martin didn’t call me in for any help with the read. How easy was this? For several holes, very easy. There was nothing easy about the course, which has narrow corridors, long rough, firm greens and extreme slopes. But Martin made it look that way. Fairway, green, near-birdie at No. 2. Fairway, green, near-birdie at No. 3. Pured eight-iron to 11 feet at the par-3 4th, where his birdie putt just slid by. When Martin roped his driver 307 down the left-center at the subsequent par-5, it really felt like we were in for a great day. My guy had made nearly all great swings. It’s funny, on the PGA Tour, or in golf in general, the little things that can change the tenor of a round. At No. 5, we waited for the green to clear (it was 273 yards to the front edge, but Martin crushes the ball). The wind was just beginning to freshen. The group in front of us took a long time to clear out. The line on which to hit 3-wood was visually challenging; it required cutting a blind corner over a tree down to an invisible green. Scary shot, scary result. Martin’s ball went right, through the fairway, over a bunker and into a very tricky spot 50 yards from the hole. We joke all the time about things starting to move very quickly for pros in tough spots, but there’s some truth to it. One shot hit off-line can lead to a delicate rescue mission, which puts you behind on time and out of rhythm. Martin hacked one up onto the left side of the green, and then it was still his turn. He left his putt 10 feet short of the hole, and then he watched Kisner pour in a birdie putt before missing his own. Bogey. Bogey, and even par, was obviously no issue, but the hole marked the point in the round where we started to scramble. Martin missed the fairway left at No. 6 but hit an impressive recovery shot to the middle of the green and made par. Feeling aggressive at No. 7, he pulled driver and hit a screaming missile down the middle that went 340 yards and would have gone farther had a fairway bunker not gotten in the way. His approach went two yards over the green, and made bogey. His tee shot at No. 8 went well right. Bogey. His tee shot at No. 9 went well left, and his approach sailed right, into the pine straw. He made a five-footer for bogey. We were now fully aboard the bogey train, and there were no signs of getting off when Martin’s tee shot at 10 sailed right, providing his caddie a great chance to take down the spectator ropes and move a bunch of people’s lawn chairs out of the way. Despite a cleared path, Martin’s second shot hit maybe five feet short of perfect and grabbed in the thick rough. He chunked his third some 30 feet short of the green. But then he nipped a delicious wedge shot that landed perfectly into the front slope and ran out with just the perfect pace and fell into the hole. He raised his arm as the ball fell in, waving to the crowd, which was starting to gather as we approached late morning. Par! It was like a cloud had been lifted. If a good caddie can keep his player from boarding the bogey train, well, I was not that guy on Thursday. The chip-in ushered a calmer stretch. He salvaged a blocked tee shot at 11 with a nice up-and-down for par. At No. 12, he hit the fairway and a green for the first time since the 3rd, although he wished his wedge went closer. At 13, a 191-yard par-3 over water, he pulled eight-iron and hit a real striper to 15 feet. Another near-miss. He faced a similar birdie try at the par-5 14th but hit it four feet past, then missed the comebacker. The wind was really starting to whip now, and the greens were getting slick. The closing holes were three of the day’s hardest, but they provided unique caddie opportunities. At 16, Martin pulled driver to try to cut off the corner over the water, but pulled his tee shot into the pine needles in the midst of a large-ish crowd, near where Tiger Woods played escape artist last year. I did my best Steve Williams Lite impression, forming a perimeter, asking for everyone to “stay real still, please,” and holding my arms up as Martin hacked back to safety. At No. 17, a 196-yard par 3, I made my first caddie call-off of the day. The wind switched from dead into us to left-to-right, and Martin had a five-iron, which seemed so clearly like too much club that I nudged him. I felt vindicated when he flushed six-iron over the pin. But then it seemed to matter less when he took three putts from there. But it wasn’t until 18 that I faced my truest test: the bunker rake. Martin hit the fairway with his tee shot, leaving himself a six-iron shot significantly uphill and into a stiff wind. He caught it heavy and it dove into the front left bunker, still 30 yards from a precarious back pin. He grabbed a 52-degree and gamely attempted a heroic recovery shot, but his wedge bounced off the firm bunker bottom and the ball sailed over the pin and into the back bunker. Fans of Caddie Chronicles, Day 3 will recall that in this situation, a fellow caddie should grab the rake job because it’s still Martin’s turn to play (in this case, the duty fell to Alistair Matheson, Luke Donald’s looper). One bullet dodged. But it meant that my first rake job of the week would come in the back bunker at No. 18, in front of the stadium crowd, the largest gallery of the day. Yikes. Above all, the plan I had laid out ahead of time for this situation was “take your time.” As Kisner circled his putt from the green’s lower tier, I began my attack, smoothing with the rake’s flat side before flipping it around for some gentle toothing, as Matt Kuchar’s caddie, John Wood, had advised me. It was a deliberate process, but I felt good about early results. I paused as Kisner stepped up to his ball, then quickly resumed after contact. Friend of the Program Sean Connelly captured the moment, with Martin looking on … anxiously? Afterward, Luke Donald’s coach Patrick Goss described the job as “well done, albeit world record slow.” Golf Channel writer Will Gray was looking on, too: “It truly was a thing of beauty. You could feel each grain being re-positioned with great purpose,” he wrote later on Twitter. Martin made the second up-and-down, which was incredibly impressive, for a six-over 77. That left him 10 shots behind each of our playing partners, who sat T-3 after matching 67s. Kisner had put on a ball-striking clinic, hitting 11 fairways and leading the field in strokes gained: approach and strokes gained: tee to green. Donald showed off the short-game wizardry that sent him to World No. 1 earlier this decade. He hit just eight greens but shot four under, requiring a ridiculous 22 putts to complete the round. Beyond pleasantries and game-play communications, I realized I’d hardly spoken to either of them. That came as a combination of us zig-zagging the course and their holding consistent focus. Play isn’t exactly speedy on Tour, but everyone nearly always has a job to do. The most interesting — and precarious — part of the day came after the round. How does a PGA Tour pro make sense of — and deal with — a 77? Guys do it all sorts of different ways. For Martin, who ranks near the top of the Tour in strokes gained: self-awareness, the key is not to internalize a bad score — or a good score, for that matter. Any given round doesn’t change who he is as a player, and definitely not as a person. In a game as demanding and inconsistent as golf, he says, that type of investment is a certain way to become miserable. After a post-round lunch in the locker room and a quick nap back at our host housing (we’d since upgraded from the Holiday Inn) Martin and I snuck out onto the adjacent golf course, where he caddied for me while I hit a handful of eight-irons. Then we headed off to get some dinner, Greek food. He was in good spirits. We spotted Joel Dahmen, one of the first-round leaders, from across the restaurant. Life goes on after a disappointing round. How does a PGA Tour player deal with shooting 77? 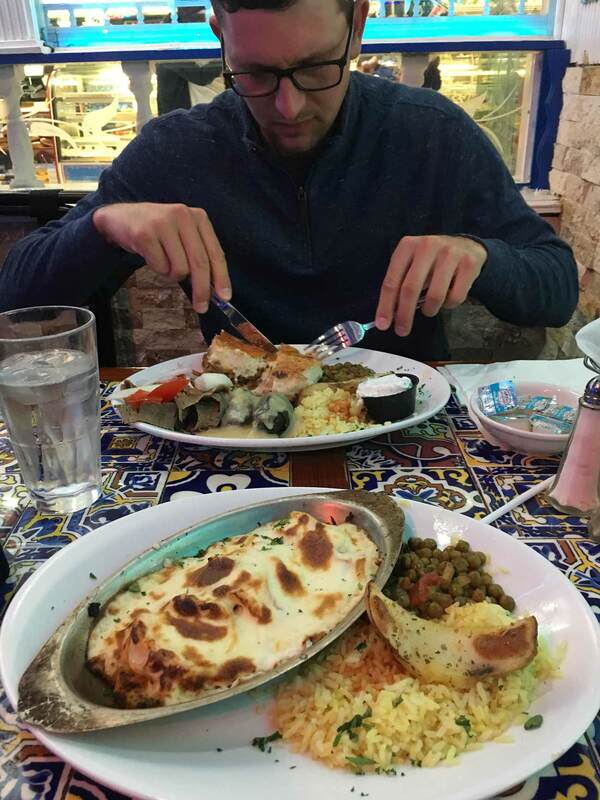 Martin Trainer broke it down over Greek food. At dinner, Martin expanded on his post-round thoughts. “A couple years ago, a round like this would have devastated me,” he said. That was before he’d won on the Web.com Tour, and before he’d won on the PGA Tour, and before he had top successes to draw on, to give him confidence, to not take one bad round and make him question everything. It’s a reminder of how many guys there are with less success, toiling in golf’s minor leagues, living and dying with every round. But sometimes a bad score is just a bad score. We also broke down what could have worked better in our player-caddie dynamic. Martin had told me he hates the sort of disingenuous rah-rah bravado that some caddies give, whether it be punch-on-the arm “Let’s go!” or unreasonable goals like, “Okay, let’s birdie the next three.” Again, there’s no gain to be had from attaching your own emotions to the results of your golf shots. But I took that too far, thinking he meant to essentially ignore the results of the shots themselves. Sometimes, a little empathy goes a long way. Overall, there was plenty I didn’t do. Didn’t come in for any green-reading. Didn’t kick out any rowdy fans. Hardly talked to our smooth-swinging playing partners, or even their caddies. (The longest caddie conversation we had was about Duane Bock’s melon-sized calves, which are unlike anything I’ve ever seen.) Still, I was busy the entire loop. The course played hard, particularly as the day wore on, so there were plenty of high scores. Still, the cut is unlikely to go beyond two over. That means Martin will need an epic round in the afternoon wind on Friday to have any chance at making the weekend. But that doesn’t mean he’ll change his effort or his approach — he’ll try not to, at least. “It doesn’t really do any good to do anything beyond hitting the shot in front of you,” he said. I’ve been deputized to help read greens after we ranked 143rd out of 144 in Thursday putting. To walk and read the same greens as Luke Donald — what a thrill! With any luck, we’ll avoid any more bunkers.